A large 12th-century church with a 14th-century nave. St Laurence's is worth visiting for its wonderful collection of medieval wall paintings, stained glass, and a pair of 14th-century table tombs. St Laurence's is composed of a nave, chancel, and west tower, all in Perpendicular style. This is the second church at Combe Longa; the first lay in the valley below. In 1395 it was rebuilt atop the hill for the monks of Eynsham Abbey. The original village of Combe lay, as its name suggests, at the bottom of the hill, on the north side of the River Evenlode. We do not know when the village was first settled, but Roman coins have been found here, and the remains of an Iron age house has been uncovered nearby. 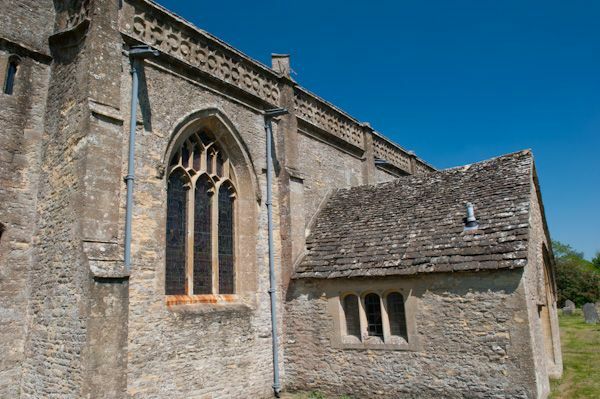 The first church was probably built in the late 12th century, but the first recorded mention comes in 1141-2 when Empress Maud granted it to Eynsham Abbey. 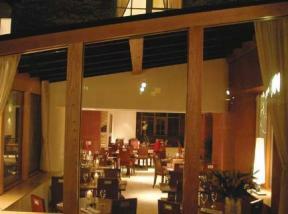 In 1478 the Bishop of Lincoln bought the living from the Abbey and granted it to Lincoln College, Oxford. The College was responsible for appointing chaplains for Combe church. 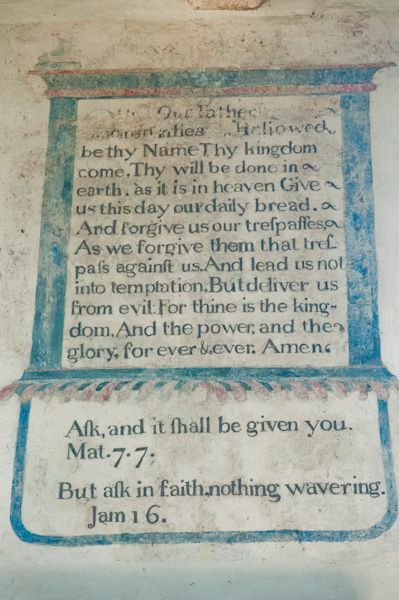 On occasion, college Fellows would come to Combe to preach or attend services. John Wesley did just that when he was attending Lincoln College in 1731, 1737, and 1743. The first mention of 'Combe Longa' comes in 1357. The 'Longa' may be a reference to the long, spread-out arrangement of the village. Alternately, it may refer to a long causeway built from houses near the current Church Walk, down the slope to connect with the village in the valley below. Traces of this causeway can be seen in the course of Church Walk, between the churchyard and the village green. You enter the church through a 14th-century porch (don't be fooled by the date 1595 inscribed on the porch gable - it refers to a rebuilding). As you pass through the doorway look out for several small carved crosses on the door-jambs. 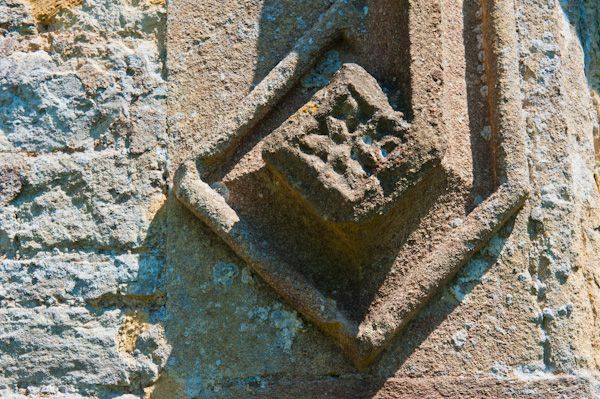 The church guide suggests that these crosses were carved in the Middle Ages to commemorate vows. The oldest part of the building is the 14h century chancel, with a very nice three-seat sedilia in Decorated Gothic style on the south wall. By contrast, the nave is late 14th century, and you can see the transformation towards Perpendicular style. One very unusual feature is the stone pulpit, set into the south-east wall of the nave. Pulpits in parish churches are usually made of wood, with stone pulpits very rarely found outside of monasteries. The pulpit is decorated with blind tracery panels. If you look closely you can see that each panel is unique. And if you are feeling sprightly enough to kneel, you can see that the pulpit rests upon a carved head. The nave roof dates to 1632; the date is carved on the second truss from the east end. The chancel roof is even more interesting. It is decorated with coloured bosses. One carries the arms of Lincoln College, another the blue cross of a controversial rector named Edward Tatham. Tatham was at the centre of a social storm in 1822 when the so-called Combe Riots broke out. In a nutshell, Tatham tried to eject Bartley Lee from the post of chaplain. Lee was supporting the small farmers of the region, who were asked to contribute more to the poor rate than they felt was right. Factions formed, with Tatham and large landowners supporting the major landowner, the Duke of Marlborough, and the lower classes and small farmers backing Lee. The animosity provoked by this episode encouraged a climate of social dissent, and Combe gained a reputation for a rebellious attitude towards authority. 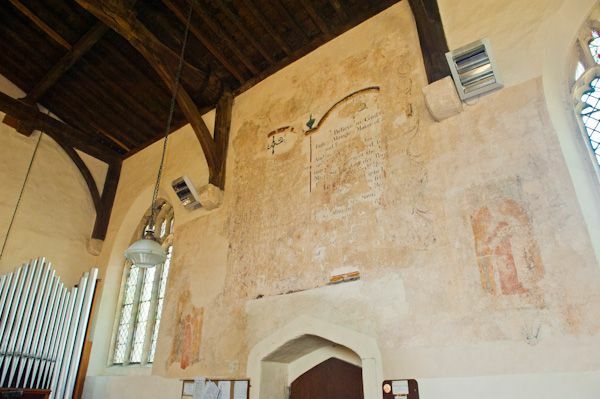 This is why most people will want to visit Combe; the medieval wall paintings are superb. 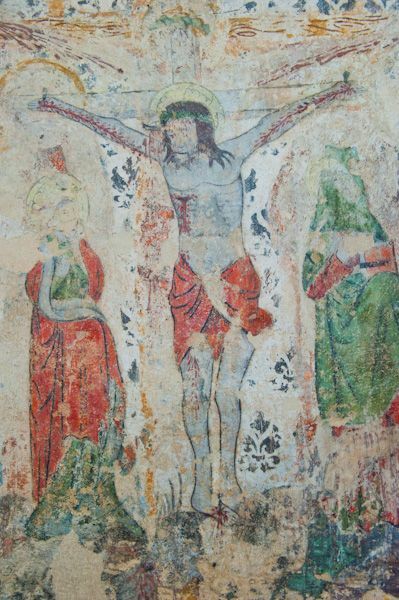 Most of the paintings are from the early part of the 15th century. They were covered over at the Reformation and were only rediscovered in 1892. 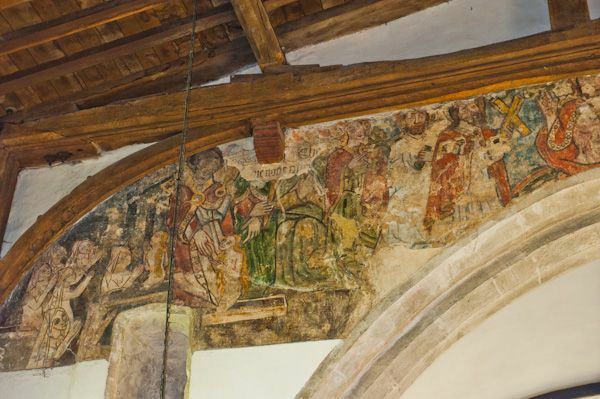 The first wall painting you see is St Christopher, in his traditional place directly opposite the main church entrance. According to Biblical tradition, St Christopher carried the infant Christ across a river. From this tale he became the patron saint of travellers, thus he is usually portrayed where people entering or leaving the church will see him. 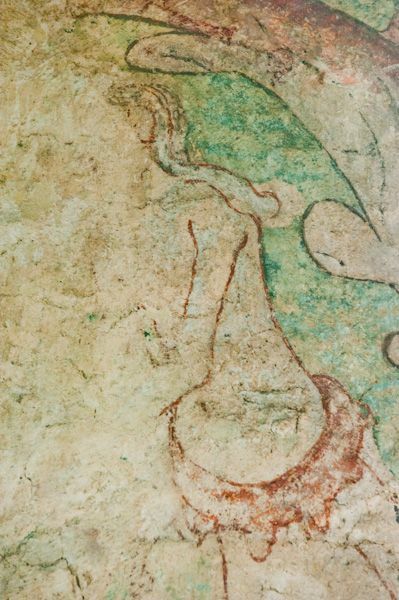 The figure of the saint is obscured, but to either side you can see figures of animals, including an otter, shark, fish, and a lively mermaid. 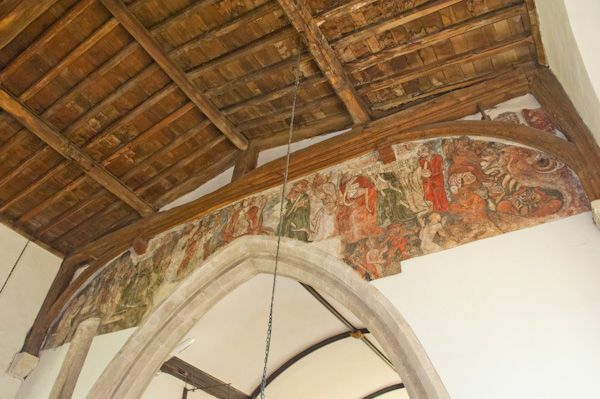 Over the door are 14th-century figures of St Catherine of Alexandria holding a sword, and St Margaret of Antioch slaying a dragon. 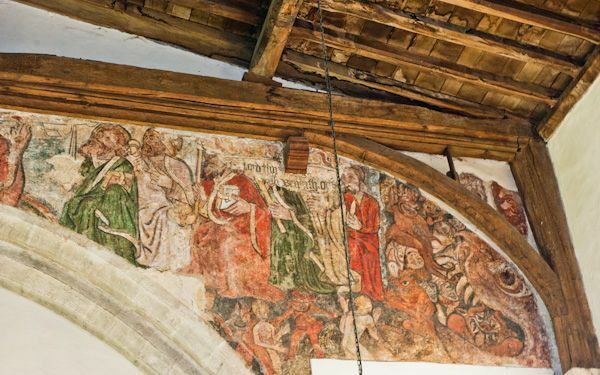 By far the most impressive and eye-catching of the paintings lies over the chancel arch. As you might guess from the location, the painting depicts the Doom, or Day of Judgement. The centrepiece of the scene shows Christ enthroned, as sinners and saints arise from their graves and are apportioned to hell or heaven. In a fascinating bit of social commentary, the sinners are represented by a woman in a revealing gown, a miller, and a priest. On Christ's right, assisting the virtuous gain heaven, are figures of Apostles and saints. On the left side of the chancel arch is a retouched Crucifixion scene, while to the right is an Angel of the Annunciation. The paintings are incredibly vivid and arresting; definitely one of the finest collections of medieval paintings in the area. There is a wonderful collection of medieval glass at Combe. Many fragments have been gathered in the south-east nave window, where you will find small pieces of 13th-century grisailles glass (grisailles is a technique of painting in a monochrome colour scheme). There are several fascinating paintings of small birds. There is also much mid-15th-century glass, particularly in the large east window. Most of the pews are 19th century, and of little historical interest, but the most heavily decorated set of pews were brought here from the chapel at nearby Blenheim Palace. There are also three restored 17th-century chairs. 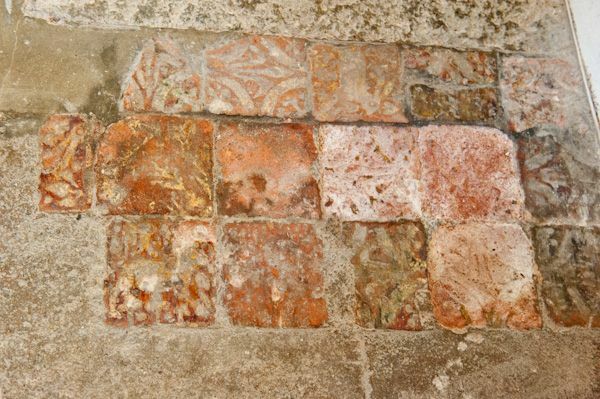 Under a small piece of carpeting at the south-east corner of the nave is a very small area of medieval tiles. One of these tiles depicts an amusing little rabbit, another illustrates a dog. Beside the tiles is a large stone bowl in Perpendicular style. 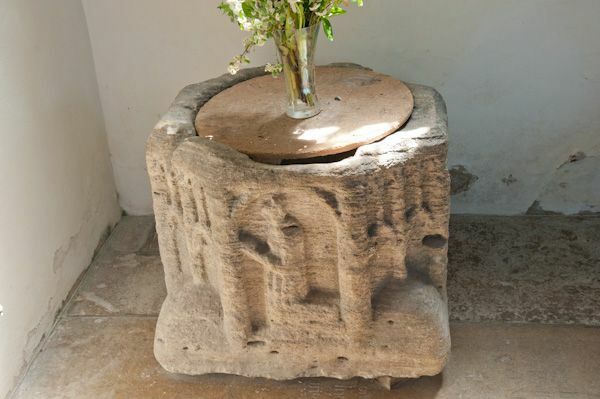 This may be the original font, or, alternatively, it may be the base of a medieval cross. It was discovered in a local garden, having previously been used as a well-head. The current font is a sedate octagonal 15th-century affair, decorated with blind tracery panels, each one unique. 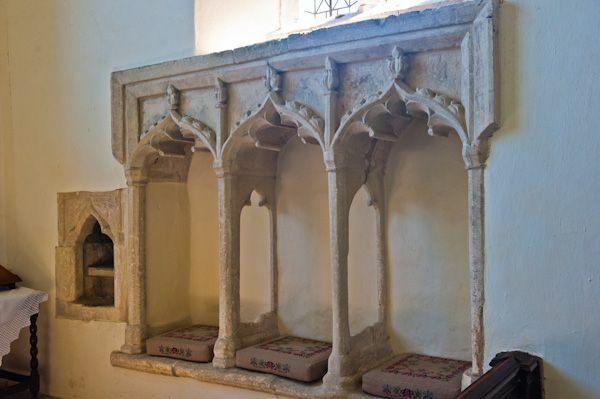 One completely unexpected historic feature at Combe is a pair of 14th-century table tombs in the churchyard. It is extremely rare to find exterior table tombs of this age still intact. The sides are decorated with quatrefoil carvings, though the tops are much too worn to decipher. NB. You will see the name of the village spelled variously as Combe Longa or simply, 'Combe'. 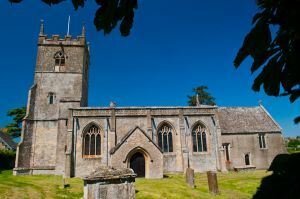 The actual name of the parish is indeed Combe Longa, and that is the traditional appellation of the village, though it may appear on modern OS maps as Combe. On the subject of names, you may also see the church listed as St Lawrence, but the official church website spells it St Laurence, so that's what I've gone with here. Location: Just downhill of the village green, off Church Walk. Park anywhere around the green and stroll down to the church.